One thing you can do with a definition list is create your navigation menu. For the most part, coders seem to rely heavily on unordered lists for navigation menus, but a definition list might make more sense. Think about a typical WordPress sidebar. It includes a header and a list of items that relate to that header. Doesn’t it make sense to think of the header as a definition and the list of items as the definitions for that term? This makes even more sense when you have specific sets of navigation items. For instance, if you have a “quick links” menu, a task-based navigation menu (link titles that describe tasks or goals that will be accomplished by clicking the link) or an audience-based navigation menu (link titles that relate to the specific type of visitor being targeted by the content being linked). 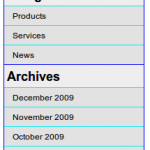 Another practical use for definition lists would be to use one for a timeline or a list of items organized by date. For instance, going back to the WordPress example, you could use a definition list to display a list of posts according to the date on which they were published. The dates themselves would be represented as definition terms (dt) and the post titles and excerpts would be represented as definitions (dd). You could then apply some fancy styling to the dates and format the titles and excerpts however you choose. 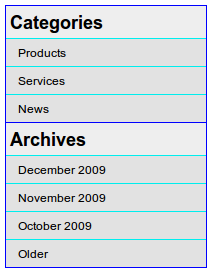 When creating a timeline recently, I used a definition list and added some CSS to make it look rather nice. Following is an example of the code I used. 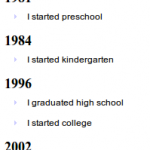 I then used CSS similar to the following to make the years really stand out and to make the milestones look like bullet items. These are some very quick, dirty, simple examples. With a little extra effort, I’m sure you could come up with something much nicer and better designed. Give it a shot the next time you’re working on a project. This would also be a great format for a Faq! It really separates the topic and the definition in a way that is not cluttered yet is clearly defined. Thanks! Thank you for this! Needed that display:list-item piece, which I haven’t seen anywhere else. Just testing. It seems your site pulled my photo from somewhere and want to see if it was because I was logged in to FaceBook, or something else. I’m a dork. It was WP ;) Sorry to be a pain.